In the example below, the ad is promoting a home for sale. 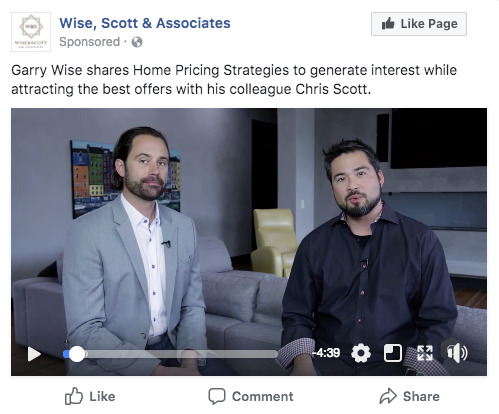 When a person clicks on the ad, they are taken to a page on a website with more photos and information about the home. 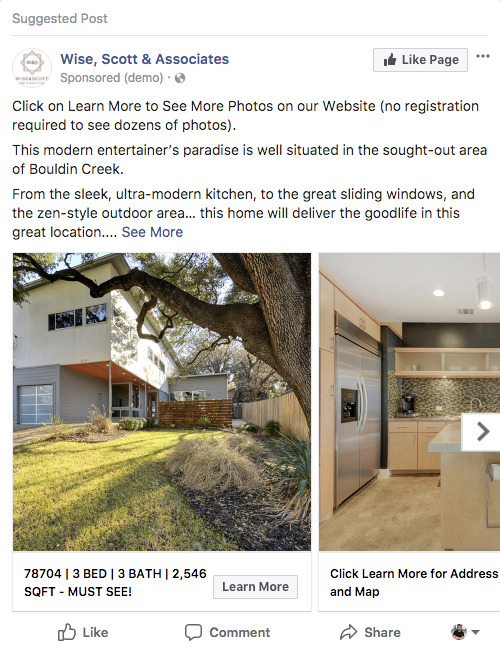 Note the emphasis in the copy to entice people to keep looking at photos and getting more info from the website: “See More Photos on our Website” and “Click Learn for Address and Map”. A study conducted by Facebook found that there is a significant increase in impact on the consumer when they watch video, with brand impact and awareness taking place after only 3 seconds of viewing a video. When using the Video in your ads, your primary goals are to build affinity and trust with the viewer, while providing informational value. People must constantly be reminded that we are available to help them with real estate services so that when they need us, they will think to contact us versus someone else they know. By viewing video, people will also develop an affinity for you because they will feel like “they know you better”. This is a phenomenon observed in television and in movies where people “like” the celebrities they watch. Messenger campaigns are designed to start a conversation. 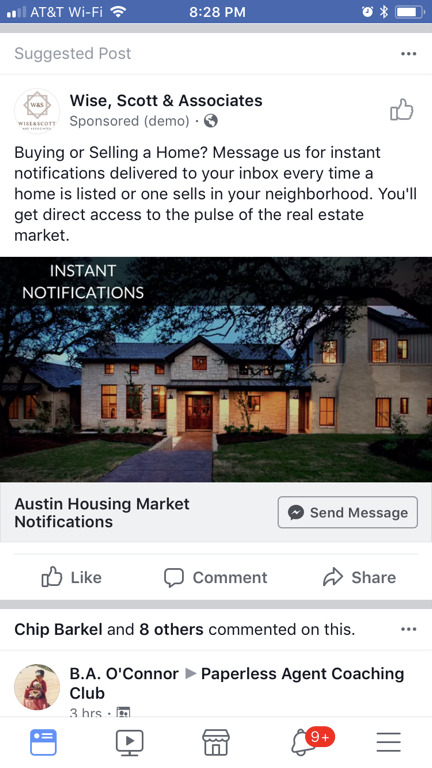 In the example below, the ad is promoting instant notifications delivered to your inbox. When they click on Send Message, a messenger dialog pops up and you can communicate directly with your new client. Did you know Instagram gets 58X more engagement per follower than Facebook? Instagram is the king when it comes to connect with people on social medial. Best of all, Instagram is owned by Facebook. Not only is Instagram owned by Facebook, they share the same advertising platform. 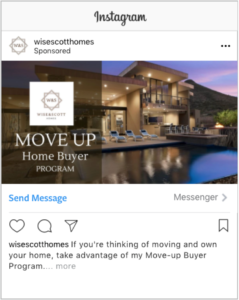 When you create an ad in Facebook, you have the option to place your ad in Instagram as well. It’s that easy!